We depart Seisia at 9 am and go out towards the airport. This was the World War II airstrip as well. Half an hour later we arrive at the wreck of a Douglas DC-3 that is located in an immediate line west of the runway. It crashed here in World War II. It is located at 10º 55' 09"S 142º 26' 41"E (using AUS66 as a datum). From here we head to the airport. There is a prop of a Kittyhawk at the terminal. We then head to the other side of the airport where in World War II there were a series of fighter and bomber bases. If you turn north at 10º 56' 00"S 142º 26' 15"E (AUS66) and follow this track you will see that there are a series of taxiways and revetments where aircraft were kept. There are lots of empty and rusting 44 gallon (200 litre) fuel drums all over the place. There is the wreck of a Kittyhawk fighter at 10º 55' 53"S 142º 25' 41"E (AUS66) and the wreck of a Beafort Bomber at 10º 56' 17"S 142º 27' 14"E (AUS66). From memory, the Beaufort is more intact. From here we head south and cross the Jardine River on the ferry. At 12:45 pm we reach Logan Swamp. While on the way up we all made it through this spot without trouble, on the way back we cannot get over a small bump which is at the end of a flat swampy and muddy section of track. It is a lot muddier than when we came up. Just as we decide we will have to winch the first car through (Les), a car turns up coming north and he snatches Les out. Les then snatches all of us through. A couple almost make it, Daryl and Brian just fail getting over the bump. It takes almost an hour to get all of our vehicles through. We have lunch here and leave at 2:20 pm. At 2:50 pm we reach Cypress Creek and cross it and at 4 pm we arrive again at Twin Falls/Elliot Creek/Indian Heads Camping Area. This is where we stopped a few nights ago. We have travelled 129 kilometres today. We leave camp at 9:55 am and 15 minutes later we cross over the intersection of the Northern By-Pass road (the easy route). At 11:24 we arrive at Gunshot Creek. This is a bit more challenging heading south and it takes a few goes to get up the now slippery southern exit that we came down a week ago. We come to the intersection with the road to the Heathlands Ranger station (another way around Gunshot Creek) and a few minutes later at 12:30 we reach Bertie Creek. We have lunch here and at 1:10 pm we get back on the road. Ten minutes later we cross Dulhunty Creek and at 2 pm we are passed by a Japanese bloke on a motorbike heading north. At 2:20 pm we cross Duicy Creek and at 2:38 pm we are at Palm Creek. This takes a while to cross and Ray has a lot of problems. By 3 pm we are all over but Ray has still not got over. He does eventually. At 4:30 pm we arrive at the Wenlock River and cross it. We camp on the western side of the OTL, right next to the river. It is not the best camp site but it is the only one available as all the best ones are on the north side and already totally full. One of the vehicles on the north side is a flat top tow truck. Daryl and I swim over and speak to the bloke, wondering why he I is up here. Apparently he has been here for two nights and is waiting for about 100 Citroens that are on a trek to Cape York. They have come from all over the World and his role is to carry them across the river so that they do not have to get wet. We think that we may run into them in the next day or two but we do not see them. Also on the northern side is a Datsun 120Y which has its doors open (to let it dry out). 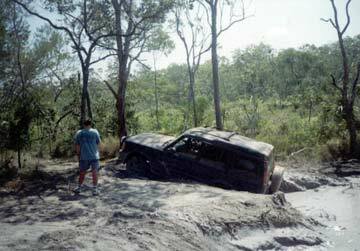 The owners are taking it to Cape York and where they have to cross rivers or creeks, their friends tow it. This is how it got across the river. Later, while we are setting up for dinner, a small Suzuki comes to the water's edge and then comes up to our camp site. He asks a few questions about the depth of the water. When we question him, it is apparent that he has only just purchased it, has no recovery gear and is totally inexperienced. He says that he is crossing the river so a few of us scramble down to the river and wait for him to arrive. He comes down the track and we ask him if he has his hubs locked. "Yes" he replies. He enters the water and about halfway across he starts to have some problems. The Suzuki is jumping all around and it is obvious that he does not have the front hubs locked as otherwise he would be easily across the river. Finally he gets across and when he opens his doors, a bit of water flows out. At least he got across but it is hard to see how he will make it all the way to Cape York. Today we travelled 129 kilometres, the same as yesterday. This morning we are up early as Daryl and I intend to be the first ready. This will be the only time (apart from Coen) that we are first ready. At 8:30 am we leave and at 8:57 am we arrive at Batavia. This is the same spot where we came onto the OTL from Weipa. Back when we stopped here for morning tea, someone lost an item (I cannot now remember what it was) and we have a search of the area where we stopped and it is soon found. We backtrack north and six minutes later we come to the turn off to Portland Roads. This is called the Frenchmans Track but it is not signposted. The intersection is 12º 30' 41"S 142º 40' 28"E (AUS66). We turn right to the east and follow this. At 9:30 am we cross a creek. This is steep in and out and very sandy. The depth is about 0.3 metres. We stop here for morning tea and leave at 10:05 am. At 10:11 we cross another creek. This is also steep and is a bit deeper at 0.4 m. The track is also narrow. At 10:11 am we cross the upper reaches of the Wenlock River. It is a steep entry and exit and the crossing track is narrow. The depth is about 0.4 metres. About 42 kilometres from the turn-off we come to the Pascoe River (11:14 am). This is 12º 42' 04"S 142º 01' 27ºE (AUS66). The Pascoe River is both deep and running very quickly. We walk across and check it out. It is going to need some expertise to do this without damaging our vehicles. The water is flowing from right to left and the left side of the crossing is shallower than the right side. It is perhaps 1.25 metres deep on the right and 0.3 metres on the left. Les goes first and the water comes well over the bonnet. He gets across but some water has come in, his undies are wet! It appears that the strong current has forced water in through the seals. Daryl and I get some towels and put along the door seals on the right hand side as the LandRover has a CD-stacker on the floor under one of the seats. We go next and get across okay, although a little water does come in but it is caught by the towels. The others all come across in due course and we are back on our way by 11:46 am. As we head up out of the river David calls us on the radio to advise that he has broken his fan belt. The water was obviously too much for it. It only takes 18 minutes to change and we continue on our way. At 12:26 pm we reach the main Portland Roads Road (12º 45' 25"S 143º 05' 10"E - AUS66). At 1:25 pm we cross the Claudia (or Claudie) River and stop for lunch. As we go to leave at 1:43 pm, John again has an electrical problem. We do not get going again till 2:10 pm. At 3:05 pm we reach Chilli Beach. This is an absolutely beautiful place, with a lot of great camp sites right behind one of the most idealic beaches you will ever see. Behind the sand on the beach are coconut trees. After we set up camp, a few of us have a swim in the crystal clear water. Ray sets up his chair under two coconut trees and says "You remember the start of The Beverly Hillbillies where Granny is carried in her chair on the top of the truck because she refuses to leave Tennesse, this is how you are going to have to get me out of here". It is understandable, it is such a nice place. Today we only travelled 108 kilometres. Today we are not going anywhere, so I went fishing. I hook a lot of fish but most of them break the light line I am using. I finally land a large trevally. Later in the day we drive the short distance to Portland Roads. This is a strange little village, with no shops. Most people seem to be left over from the 1960s, a little bit of a hippy commune. We have another swim or two. Daryl and I add the almost 22 litres of diesel we purchased in Cairns into the fuel tank. We meet up with the others who have driven to Portland Roads for a look. We drive to Lockhart River. This is an Aboriginal community nearby. We do a bit of sightseeing and also buy some things at the supermarket. This is a very good shop, again, far better than Weipa's supermarket. We drive to the beach and have morning tea here. We leave at 11:25 am. At 12:35 pm we pass the Frenchmans Road and at 1:05 pm we reach the Pascoe River. It is a lot shallower here and easy to cross. We leave at 1:35 pm after lunch. At 2:25 pm we get to the Wenlock River. On the eastern side and north of the road are the ruins of the Old Batavia Goldfields. This is quite interesting and well worth a look around as there are lots of old equipment and structures to be viewed. There is also some reasonable camping on the sides of the river. We leave here at 3 pm and arrive at the Archer River, back on the OTL at 4 pm. We set up camp on the northern side of the river. There are a few nice spots here to camp. Daryl and I go for a swim on the western side of the causeway. Before dinner, Daryl and I go to the Archer River Roadhouse which is on the southern side of the river (there is also camping and accommodation here). We have a couple of beers and purchase a carton of XXXX Gold as we have almost run out (we miscalculated how many beers we might need!). It is $40 a carton, a lot considering it is about $22 a carton back in civilisation. However, when you consider where we are, I suppose it is not too bad. Today we have travelled 186 kilometres. We leave Archer River at 8:36 am. At 9:45 am we reach Coen. Here we refuel. We out in 40 litres at $44 (it has gone up since we were here two weeks ago). We have averaged 9.2 litres/100 km for the 673 kilometres since Seisia (not sure if the tank was full, perhaps it wasn't). At 2:30 pm we arrive in Laura and go to the hotel were we have a couple of beers. At 3:20 pm we book into the camping ground. This is run by the local Aboriginal community. It is fairly nice, although the swimming pool is dirty.